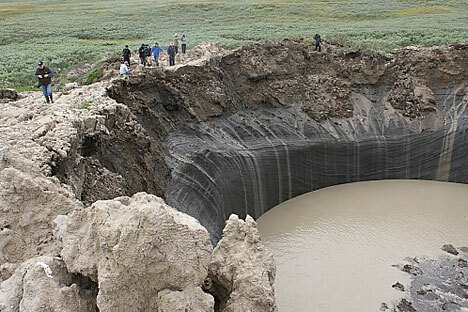 A massive crater discovered in the Yamal Peninsula in Western Siberia last year has begun turning into a lake, a scientific expedition to the area concluded. Over the past year the mysteriously formed crater has filled with water, now reaching a depth of ten meters. Predictions were made when the mysterious crater was discovered in 2014 that it would turn into a lake. Scientific predictions about the crater in Siberia appear to have come true. Some scientists, like Vasily Bogoyavlensky, head of the expedition and a researcher at the Russian Academy of Sciences’ Institute of Oil and Gas, even suggested that several Arctic seas may have come into being in a similar way. Researchers have also propounded another hypothesis; that the origins of most round, tundra lakes on the Yamal Peninsula are linked to thermal gas. According to Bogoyavlensky, the process takes place in locations where paleo-congelation is occurring and there is underground ice. Climate change has caused hills to emerge in these areas, some as large as two kilometres wide and dozens of metres high. In 2014, three expeditions were sent to study the crater’s origins. They all came up with different theories about the origins of the phenomenon. Scientists from the Trofimuk Institute of Petroleum Geology and Geophysics in Novosibirsk said the zone where the crater is situated is located at the junction of two large faults that cross the peninsula. In their view, the environment was warmed by heat rising from the core of the Earth along the cracks in the crust, as well as from above, due to the high summer temperatures in 2014. There was also an emission of gas hydrates, which are present in the peninsula, both deep underground and on the surface. The scientists believe that these are the same phenomena that occur in the Bermuda Triangle. The biggest crater is located approximately 30 kilometres from Bovanenkovo (70°26’17.00″N 68°19’27.00″E), on the site of a large natural gas deposit. The diameter of this crater is about 40 metres, and it is gradually increasing.